Hawkins & Powers Aviation Inc.; crashed at Story, WY; 3 seriously injured, 1 slightly injured and 2 uninjured. 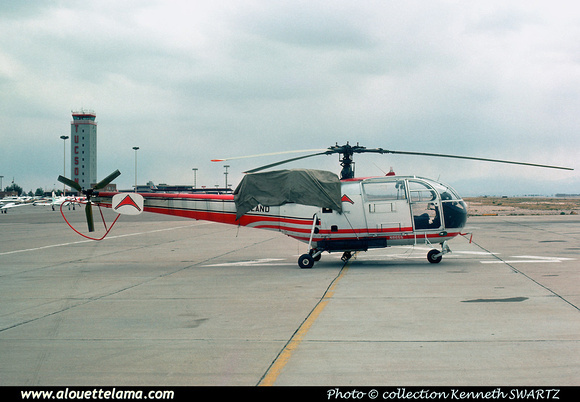 N8655 Eurocopter (Aérospatiale) SA316B Alouette III MSN 1728, Inland Helicopters - Tucson, AZ - KTUS - 04-1975 - Photo Kenneth Swartz collection. Dernière mise à jour/Last update : 23-02-2012. L'usage des logiciels Firefox ou Safari est recommandé. The use of Firefox or Safari browsers is recommended.